Did the Nazis have a conscience? A globe ruled by Beijing? 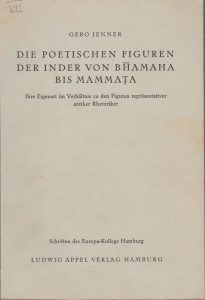 Toward the end of my assistantship at the Indological Seminar, Berlin, I disappointed expectations with regard to my person as I did not deliver the announced habilitation paper on Patanjali’s Yogasutram. The more I became acquainted with the subject, the less I liked it. On the other hand, I had previously dealt with Edward Sapir’s work on Indian languages while still being a lecturer in Japan (before my work in Berlin), and found the subject of General Grammar so stimulating that I picked it up again – which was perhaps rather foolish. The blame of foolhardiness would, however, apply to Noam Chomsky as well, who, to my knowledge, only knew Spanish besides his mother tongues Hebrew and English. I had received the usual schooling in Latin at the Gymnasium, later promoted in Sanskrit, worked for a time as an interpreter for Japanese, read and understood Chinese and Russian, and had studied in France, Italy and England. Being credited with a certain gift for languages I was admitted into the „Studienstiftung des Deutschen Volkes“, an elitist scholarship organisation. In other words, I did not, perhaps, need more boldness than Chomsky when facing the subject. The submission of a thesis on General Grammar for the purpose of habilitation, had, however, a disturbing effect. While one of the reviewers, the linguist Peter Hartmann, frankly accepted the thesis, it was rejected by another member of the commission, namely by Bernhard Schlerath, at the time the senior linguist at „Freie Universität Berlin“ (whom I had not informed about my project). Since then, linguistics has taken a different approach. Today, it mainly deals with practical and pragmatic challenges of machine translation, a turn of research that led to great achievements. My work on general grammar is neither practical nor pragmatic. A former entry in Wikipedia (now deleted) ascribing this trait to it was, therefore, misleading and presumably due to the fact that Jef Verschueren, a pragmatic linguist, wrote a first benevolent criticism. 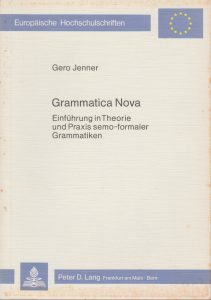 The scope of General Grammar is, indeed, much wider as it pursues strictly theoretical and structural goals: What basic elements and structures in the two areas of form and meaning enable people to generate languages? What elements and structures are common to all languages and how far these elements and structures may be transformed so as to give rise to different languages? These questions are similar to those underlying Chomsky’s generative grammar, but the method adopted as well as the final outcome turn out to be fundamentally different. 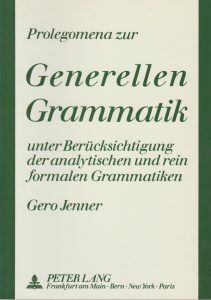 General Grammar as I conceive it goes back to the findings of Aristotle and the „Grammaire générale et raisonnée“ of Port Royal, on the one hand, while, on the other, it could well point to the future. This would be true if the results obtained were confirmed by neurological research, in other words, if form, meaning and syntax (roughly speaking: acoustic marks, concepts and their permissible links) were found to be encoded in different areas of the brain. 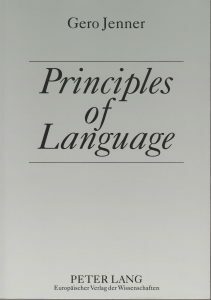 Only the last work entitled „Principles of Language“ represents the final version. 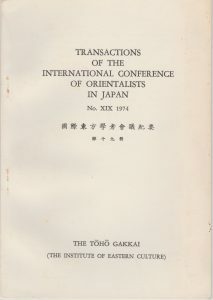 A small publication on characteristics of the Japanese language was likewise devoted to questions of linguistics, and so, in a wider sense, even my dissertation on Indian poetics.